If you've got platinum dreams, the best shampoo for your blonde or highlighted hair is Paul Mitchell Forever Blonde Shampoo. Massage into your tresses for an instant boost of hydration. Paul Mitchell Forever Blonde Shampoo is paraben and gluten free. Beauty Directprovides only the best products. We strive to get the highest quality products to your doorstep fast, and at a reasonable price. This lightweight conditioner leaves blonde hair looking non-greasy and fortified. This condtioner is specially formulated to cleanse hair of impurities leaving it looking and feeling shiny and soft. For deep hydration of blonde hair that perfectly detangles, the Forever Blonde. ® Shampoo from Paul Mitchell. Rebuild, strengthen and protect with this gentle but effective cleanser. Preserve health, brightness and salon quality lightness with this paraben-free and gluten-free formulation. To use, carefully lather into damp hair and rinse. Paul Mitchell KerActive Forever Blonde Shampoo & Conditioner DUO . Sizes : (1) 24 oz. / 710 ml Shampoo. Included : (1) Forever Blonde Sulfate Free Shampoo. (1) Forever Blonde Sulfate Conditioner. Take your hair from blonde to bombshell with Paul Mitchell Forever Blonde Conditioner. This luxurious hair conditioner detangles and deeply hydrates leaving your hair golden and radiant. Massage a dollop of hair conditioner into your scalp and marvel at your hair's gorgeous glow. Unopened 6.8oz Paul Mitchell Forever Blonde Conditioner. Battles brassiness Repairs over-processed, dyed hair Sulfate-free Strengthens hair with KerActive proteins Use sulfate-free Paul Mitchell KerActive Forever Blonde Shampoo to protect your color-treated locks. Paul Mitchell Forever Blonde Conditioner, Shampoo And Dramatic Repair Gift Set. Condition is New. Shipped with USPS First Class Package. Paul Mitchell Forever Blonde Shampoo is just what your highlighted, over-processed hair needs. Keep your blonde hair light, bright and healthy!Sulfate Free. Paraben Free. Gluten Free. Color Safe. Factory seal is gone but bottle is still full. Paul Mitchell KerActive Forever Blonde Conditioner 24 oz. Paul Mitchell KerActive Forever Blonde Shampoo 8.5 oz. This is a real authentic hair salon Paul Mitchell Product. hair salon. This item is new, FRESH, unused, full, and the bottle is in good shape (as seen in. ). Trending at $27.59eBay determines this price through a machine learned model of the product's sale prices within the last 90 days. FOREVER BLONDE® SHAMPOO. FOREVER BLONDE® CONDITIONER. Forever Blonde® Dramatic Repair®. Deeply hydrates and detangles lightened and highlighted blonde hair. Smoothes, strengthens and replenishes depleted blonde hair. Shampoo, Conditioner & Dramatic Repair. New Paul Mitchell Forever Blonde Gift Set. SHAMPOO 8.5oz & CONDITIONER 6.8oz. FOREVER BLONDE. PAUL MITCHELL. 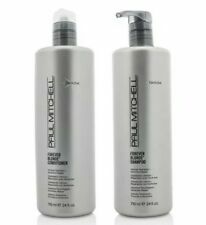 Paul Mitchell Beauty Products are designed with expert hair care in mind, without spending the expert price. Paul Mitchell Forever Blonde Shampoo 8.5 oz. and Conditioner 6.8 oz. 100% authentic. We are very serious against false claims. Smooths and repairs hair, and brightens blonde and highlighted hues. Macadamia nut oil hydrates and protects vulnerable strands. Forever Blonde Shampoo. Macadamia nut oil is infused in the formula to help hydrate your thirsty hair. Spray lightly onto damp hair. Style as desired. For best results, use with Forever Blonde Shampoo and Forever Blonde Conditioner. Paul Mitchell - Forever Blonde Shampoo & Conditioner. Paul Mitchell Forever Blonde. Shampoo / Conditioner Set. Subtly brightens blonde and highlighted hues. Set Includes 1- 24oz Shampoo, 1- 24oz Conditioner. For deep hydration of blonde hair that perfectly detangles, the Forever Blonde Conditioner from Paul Mitchell provides excellent, salon-quality results. Paul Mitchell Beauty Products are designed with expert hair care in mind, without spending the expert price. We are very serious against false claims. Any attempts with intend to manipulate our system will result in appropriate repercussions. Paul Mitchell Forever Blonde Shampoo 24oz/710ml. (excludes samples). Ker Active Forever Blonde Dramatic Repair was launched by the design house of Paul Mitchell. KerActive Forever Blonde Dramatic Repair is a lightweight yet powerful multitasking corrector. Smoothes, strengthens and replenishes depleted hair. Paul Mitchell Tea Tree Special Shampoo special ingredients and tea tree oil rid hair of impurities and leave hair full of vitality and luster. 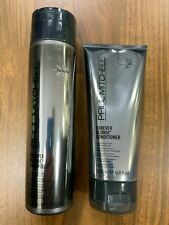 Paul Mitchell Forever Blonde Shampoo & Conditioner 24 oz/710 ml Duo Set! NEW!